Hank Mondale is an out-of-luck private investigator with his fare share of vices. When he’s not drinking Jim Beam and recklessly gambling on any game in town, he’s dodging debt collectors, landlords and even his mother. So when a high paying client wants his services it looks like Hank’s luck is set to change – and it does. 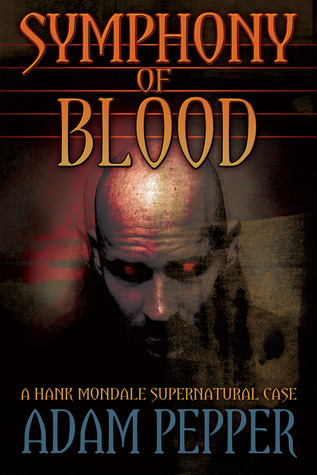 Symphony of Blood is an interesting fusion of hard-boiled crime meets creature horror. Unfortunately, I’m not sure the strength of the execution matches the novelty of the idea. The first section of the novel introduces us to the struggling, vice-ridden Hank Mondale. The style of the story at this point is very much hard-boiled detective fiction, complete with a narrative that I could almost hear as a bored and cynical voice-over. I liked the exploration of the rather tragic private investigator. I liked his backstory, his contacts, his sassy secretary and his attitude, attitude, attitude. When he receives this rather absurd but well-paying case, the initial part of the investigation is fun although there’s one hell of a coincidence thrown in. The mechanism will be familiar to frequent mystery readers: Subject has a completely off-hand conversation about a case someone is working on. Subject gets a new mysterious case where some rather minor pieces of information tie in with previous case being discussed. Subject has a hunch and previously unrelated case provides key lead to new case. I find these mechanisms a little trying as a reader because they are just too convenient and in this case there is very little subtlety involved to mask it. However, I continued to enjoy the story right up until a key crisis is reached. At this point, the reader is subjected to a completely jarring POV change that destroys all the story’s momentum. Once I recovered from the initial impact of having to replay the background elements of the investigation from the point of view of “the creature”, I did find the perspective an interesting one. Something I enjoyed about the creature in this book was that it didn’t really conform to those currently in proliferation in urban fantasy/horror novels. However, because I was waiting to continue at the point of crisis abandoned for this illuminating diversion, my interest was replaced with impatience and once I re-entered the original storyline, it was with a sigh of relief. Additionally, the narrative was a bit problematic. The author was obviously presenting the narrative from the creature’s point of view and so houses became “man-made trees” and the sun became a “red hot ball in the sky” and yet words like “footbridge”, “handrail”, “jacket” and “hallway” also appear somewhat incongruously. The last section of the book is one of flight and confrontation and this is where the story really fell down for me. The author left so many elements unexplained. Who is Angelina? Was Hank ever going to learn the full story on Mackenzie? Why was the final confrontation over in a page or two and what was the final result? And then the reader was suddenly at a “later that week” epilogue where we find out Hank is pretty much left where he started the story. I didn’t dislike Symphony of Blood and I could easily have lived with some of those elements I found problematic and still given it a strong 3.5 stars or a weaker 4 stars. However, the last section was a let down with the conclusion of the story a fumble on the goal line – and after a middle section that lingered a little longer than needed it left me a little unsatisfied overall. This entry was posted in 3, Horror, Novel, Reviews and tagged Crime, Horror, Mystery. Bookmark the permalink. You know, I’ve never been a fan of those POV changes… and things like “man made tree” will make me want to gouge out my eyes. Great review!